Homestead Kay & Chris and Homestead Joshua & Victoria are serving New York's Tri-State Area and surrounding areas. Our Rental Packages include FREE DELIVERY to the New York Tri-State Area. That area is defined as Southeastern New York, Northern New Jersey, and Western Connecticut. The rental price is based on location. For customers outside of our FREE DELIVERY area, please call us at 724-305-0782 for a delivery quote. The New York Tri-State Area is served by Homesteaders in New York and Pennsylvania. They enjoy their delivery and pick-up trips from their respective farms; however, due to the distance, if a rental chicken is not healthy or worse during the rental, they can meet with a replacement chicken within 50 miles of their location without a transportation fee. If you prefer for them to bring a replacement chicken, a transportation fee will be determined. We will credit $50 off of your Rent The Chicken or adoption for every friend referred who Rents The Chicken. Refer five friends and your Standard Rental Package or Standard Adoption is free! (That is a $400 discount!) We only credit up to 5 referrals per year per customer. Credits can never be refunded as cash and can never be used for more than one Rental Season at a time. You can now buy our coop direct from us. We build these on order so please allow two weeks from time of order until the coop is ready for you to pick up. Prices start at $400 per coop. 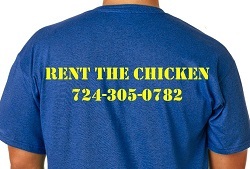 All coops include our famous "Rent The Chicken" name on the side of them.